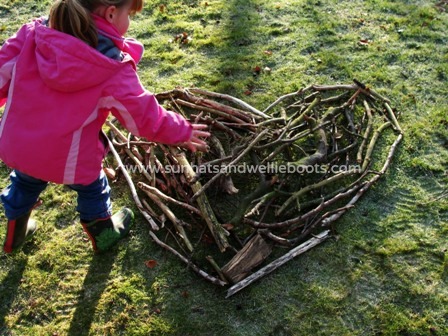 This activity brought together all the things my girl loves, being outside, building/creating, & of course her favourite accessory - sticks! 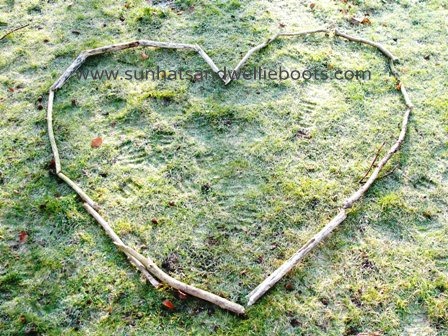 My little girl becomes quite attached to these sticks & often on nature walks she'll collect one or two along the way. Just as we're heading home there's the inevitable request that we take them back with us, the reason being "I really LOVE them Mummy!" The other morning we headed out for a wander around a nearby park, it was a beautiful frosty, sunny start to the day, & almost as soon as we entered the park Minnie had found a couple of sticks! As we walked along I was thinking about a project that Jamie from Hands on : as we grow is putting together to raise funds for the American Heart Association (AHA). She's designing a collaborative book with fellow bloggers & inviting them to submit a heart theme project for the book. As I watched Minnie strolling along with her sticks I knew our contribution had to involve something she LOVED, & the inspiration for our activity was in her hands! 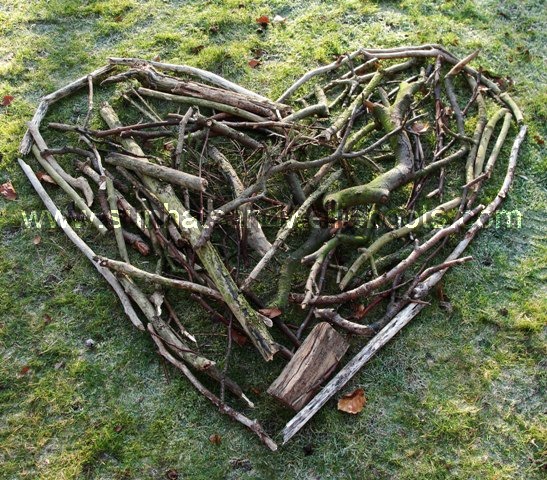 Inspired also by the beautiful Land Art created by British artist Andy Goldsworthy we started to create a rough heart shape with more sticks. 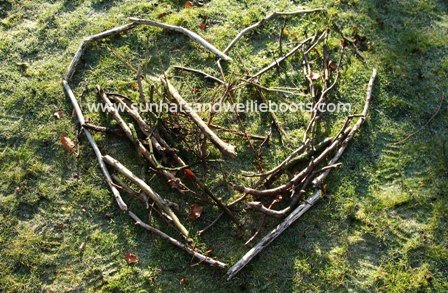 Minnie collected more sticks & began to fill in the shape. 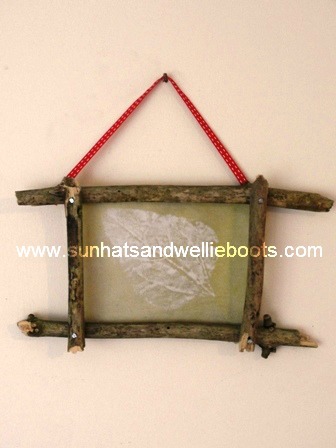 As she added the twigs she was exploring shape, length, weight & comparing & estimating which sticks would fit within the frame. Here's Minnie's finished heart & the image we've submitted for the Heart Project. 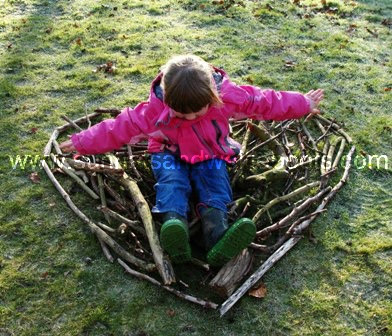 Minnie's creativity didn't finish there though, soon the heart became a home as Minnie turned it into a bird's nest! She became a bird & flew around (running & flapping her arms) before settling herself in the middle of the nest for a rest! It was obviously comfortable as she laid back & pretended to sleep! Her bird play continued until it was time for us to head home, this time though only one stick came back with us. We left the heart just as Minnie had created it, ready for someone else to find & discover. Maybe someone else will just look at it & ponder, maybe a dog will collect a stick from it, or maybe someone else will play with it. I wonder how this heart will touch other people? 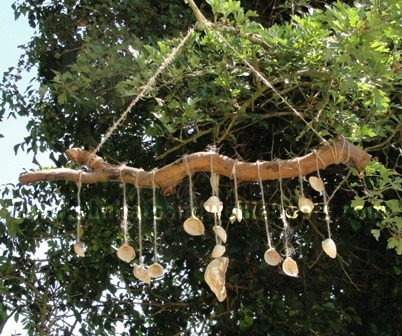 This activity encapsulates the things we LOVE - outdoor play, playing with natural objects, exploring & creating, imaginative play, & sharing play with others. The Heart Project Book will be published at the beginning of February & I'll be posting more info about how you can get your copy next week. If you're looking for creative inspiration to share with your children/grandchildren, & the chance to support an amazing charity at the same time, then this beautiful book is for you! Help us spread a little love & change lives too!